Young Creatures, alternately known as “the Creetch”, make surreal, ethereal music that combines elements of shoegaze, psychedelic rock, indie, and pop. This Los Angeles quartet toe the line between blissful dreamy pop and dark, eerie soundscapes. After dropping their debut self-titled EP in 2012 and the Habitats EP in 2013, the band had some membership changes and released their self-produced full-length debut Fear All The Things in 2014, solidifying the band’s sound and ethos as a psychedelic pop-rock group. 2017’s The Future is Finally Now was recorded at singer Mike Post’s brand new recording studio MooseCat Recording. The album built upon their foundation and expanded upon it with a more diverse set of songs that showcased more elaborate arrangements and a more sonically exploratory aesthetic. 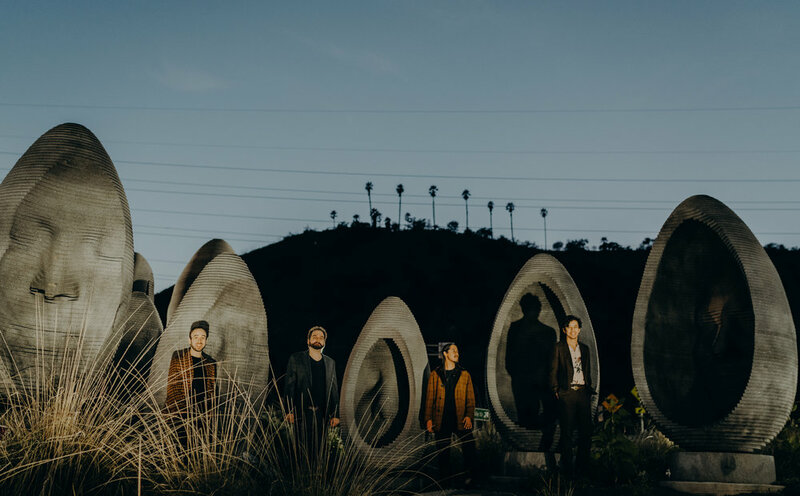 A proudly DIY band, Young Creatures have toured major cities all over North America and gotten attention from several publications, including Classic Rock Magazine, LA Weekly, OC Weekly, Buzz Bands LA, and What Youth. In LA they’ve played venues like The Bootleg, The Echo, The Satellite and residencies at the The Satellite and Silverlake Lounge. They’ve done performances for Daytrotter, Converse Rubber Tracks, Balcony TV, Sofar Sounds, & Jam in the Van. Their music has been featured in television shows and independent films, as well as on repeated plays on terrestrial radio stations such as Los Angeles’ 88.5 KCSN. The quartet of singer-guitarist Mike Post, guitarist-backing vocalist Andrew Gleason, drummer/percussionist Michael Escalante and bassist Donald Fisher are releasing a new 7”single Something I Don’t Know/Prisoner of Escape, which comes out on vinyl on November 17th on Nomad Eel Records (and is already available for streaming.) This coincides with their Creature Feature Festival on the same day, at the Hi Hat in Los Angeles, an event that should not be missed. OC Weekly - "Young Creatures Are Growing Into An Indie Rock Powerhouse"
Buzz Bands LA - Stream: Young Creatures, "Fear All The Things"
Amarillo Globe - "Psychedelic band Young Creatures to bring mysterious sound to Leftwood's"
Badass Bands Blog - Young Creatures Single Premiere "Foreigner"